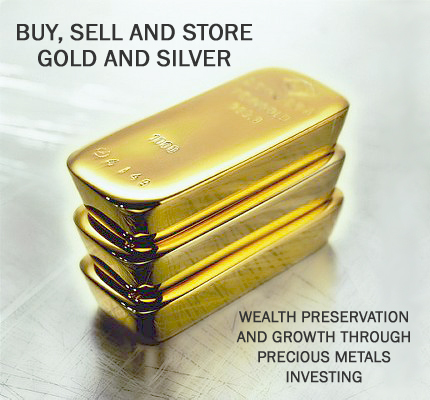 In today's financial crisis, buying and storing gold and silver is the best way to protect and increase your wealth. Gold and silver have been proven methods of preserving wealth and value for thousands of years, especially in times of crisis. Gold and silver are in a long term bull market, and are expected to continue rising during this decade. We can expect to see high levels of inflation from the money printing (QE) of desperate central banks. Gold and silver are the best hedges for inflation. With the huge economic meltdown coming our way, it is now recommended that you put no less than 25% of your portfolio in real assets such as gold and silver. If you have a substantial amount of wealth, you cannot realistically transfer a meaningful portion of your wealth into physical gold and silver without dealing with qualified experts who are used to dealing in bulk. It's not about going down to the gold market and buying a bar or two - unless you have a smaller amount of wealth to preserve. This is where GI Metals DMCC comes in. Where Should You Store Your Wealth? Although it is a good idea to keep a small portion of your wealth with you at home in both cash and precious metals, it is unsafe and impractical to store a minimum of 25% of your portfolio in precious metals at home. Likewise, safety deposit boxes in banks are usually too small for this too, and more importantly, are risky places to leave your wealth. If you understand the true nature of the global financial crisis, you will understand that you need to get your wealth out of the financial sector - now. Bank runs have already started in Europe. You need to keep it in a high-security vault of repute where you can come and access it whenever you want, or have it sent to you upon request. You also need to know that your specific bars of gold and silver belong to you, and are not included on someone else's balance sheet. There should be be a reliable audit system in place, and you should be furnished with reports of your holdings. Central banks around the world have committed themselves to printing more money, with the European Central Bank saying that it would be printing in an "unlimited" manner, and the American Federal Reserve saying that their printing programme (QE) would be "open-ended." Many analysts are now calling this QE to Infinity, or QEternity, to illustrate that central banks are in crisis mode, and that high levels of inflation are only around the corner. You need to position yourself now for the coming mania phase in precious metals when people will flee the paper Ponzi schemes and the currencies they are denominated in. Don't get fooled into buying paper/digital 'gold' or 'silver'. We believe that very soon, only those holding tangible assets with no counterparty risk such as gold and silver will be left standing. This might happen in the next year, or two, or three - but we think that the breaking point is coming soon; where everyone rushes for the exits. So you need to move quickly, before the metals prices start exploding, and you start hearing about physical shortages. Act now to position yourself properly in the greatest wealth transfer ever. From paper assets to real assets, to preserve and multiply your wealth. GI Metals DMCC is DMCC licensed, and stores its clients' metals in the most secure and reputable vaults in the world. These vaults are separate from the volatile financial system. That's the advantage.